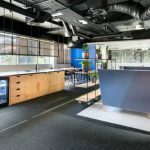 RPS Project Management and IA Design were engaged by Curtin University to transform a 2,000m2 heritage building on Murray St into the University’s new Law School. Curtin University’s vision was to create an educational environment that facilitated real-world experience with cooperative teaching and learning. The new law school was designed to co-locate private practice barristers’ offices, practicing law clinics (where students could participate in real-world legal cases), and educational facilities for teaching and learning. 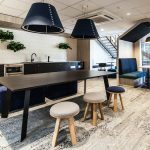 This blend of learning environments supported an important evolution in education, giving students access to real-world learning experiences whilst studying. The fitout of this heritage-listed building presented unique design challenges, with strict design and refurbishment restrictions set by the National Trust. The integration of the open collaboration areas and Moot Court facilities presented particular challenges, as the building was acoustically unsuitable for a contemporary teaching environment. This meant the IA Design team had to implement creative and often unconventional solutions to meet the brief criteria. In addition to the dedicated learning areas, IA Design created the enclosure, entertaining and gathering area as well as the fire escape for the rear courtyard. The end result was an outstanding education facility that satisfied the National Trust building guidelines and exceeded Curtin University’s expectations.